There are some gigs which are totally exhausting but utterly rewarding, Running Races are one of those such Gig occasions! They always involve an early start, and a lot of Drumming! I noticed that the my health dashboard clocked up that the Band drummed for 2 and a half hours, took +20,000 steps and covered a distance of 13km (.1km less than a half marathon!). With the added challenge of the weight of the drums. I’d like to say we had put in as much training as the runners had but hey ho, we just turn up and drum. Which is probably why I hit what I’ve heard runners call the wall about 2 hours in to the set. Legs buckled and head spun, although nothing a swig of Lucozade couldn’t put right! Its all worth it. The runners are amazing, their focus on training and their perseverance to complete the course is an inspiration. Its more than a pleasure to drum and cheer them on. There is always poignancy knowing a huge proportion of runners are running for the best of causes and charities. That some were running for someone they love that is battling against a physical or mental challenge. Or running in memory of someone important in their lives that they have lost. That is what makes it worth being there to support. So thank you Great Bristol Half for having us there. Thank you for all the lovely messages on Faceboook from the runners who said how much the energy we bring keeps them going. 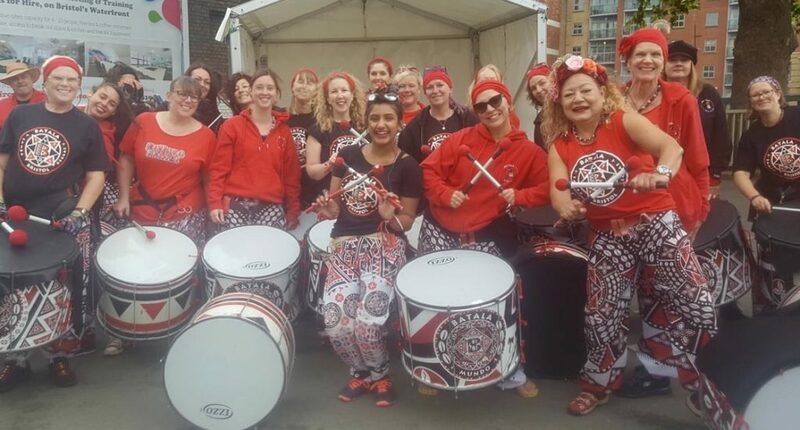 Thank you to all of Batala Bristol for giving up your time, energy and love and your Sunday for free. BIG LOVE and see you next year.